Gappsi has been installing gunite swimming pools on Long Island, NY for over 25 years. With so many options, gunite pools are the most popular. Gunite swimming pools are extremely durable and can be built in any free-form shape you want. Our expert team of landscape designers and swimming pool contractors can help inspire and offer creative concepts. Gappsi offers state of the art gunite swimming pool designs, water features, pool construction and pool landscaping. Our gunite pools are built to last, and lend themselves to waterfalls, fountains, and other built-in structures. Gunite pools can offer virtually limitless options and enable you to obtain the swimming pool you and your family have always dreamed of. This includes gunite finishes, plaster, natural stone and glass. Your gunite pool is built custom to your specific tastes and style. Gunite swimming pools are one of the most natural looking in ground pools. We can combine the flexibility of Gunite with a variety of finishing options. With this flexibility, it is possible to build a gunite pool for most budgets and lifestyles. Call Gappsi today for a gunite swimming pool design and construction consultation at (631) 543-1177. Add Value: Add more value to your home by installing a gunite swimming pool. Many experts agree that a substantial concrete pool is still a greater selling point for homes, even though fiberglass pools are sold in greater numbers on Long Island NY. Design Flexibility: Gunite swimming pools are designed and built on site and custom for your yard. This makes the design possibilities endless. Fiberglass pools, which are prefabricated to a specific shape and then installed on site are much less customizable. Additionally, due to their rebar steel framework, Gunite pools are extremely durable and will retain their shape over an extended period of time. 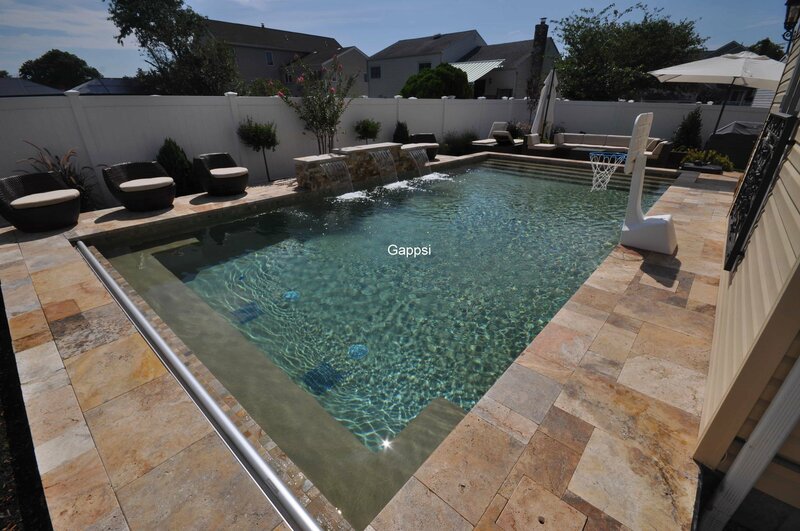 With so many swimming pool options, Gappsi can help direct you to getting the right pool for your home. Call for a gunite swimming pool consultation at (631) 543-1177 today!